Aurora is expanding its Aurora Sun facility for anticipated market demand. Yearly gross margins could increase upwards of $400,000,000 with this addition. Technical reasoning is used to determine where Aurora's next move will be regarding this recent positive announcement. In an article submitted on April 10th, Aurora (ACB) plans on increasing its largest greenhouse from 1.2 million square feet to 1.62 million square feet, representing a 33% increase. In their recent investor presentation, Aurora believed they would be able to produce at minimum 150,000 kg of marijuana and now their most current assessment is around 230,000 kg per year. The Aurora Sun plant is planned to be completed in May 2019. The expansion of the Aurora Sun may seem like an insignificant move, but to me, it displays that ACB is money-conscious and able to cater to market needs. This state of the art facility is estimated to cost around $130 million, which includes the purchase of the surrounding land. Aurora's plan to expand their current unit is a fantastic way of saving money in the future because they won't need to incur the costs and training associated with building a new facility. This facility will have the capacity to congregate over 1 million plants in various growth stages and features 37 grow rooms at 32,500 square feet each. With this, they will feature state of the art technologies that will presumably help drive the cost per gram to management's goal of $1. That would be a large decrease from their current production at $1.92, but in the next few years, Aurora believes this will be possible. Highlighting a couple of features of this facility are; a "sophisticated glass roof, rainwater and snowmelt recapture system, and automation that gives Aurora full control over all anticipated environmental and harvest conditions." Even when the facility is running Aurora plans on critiquing and improving its technologies to create "high-quality cannabis at a low-cost price." They will be able to do this with some of the strategic acquisitions that help them build a facility that functions more like a science lab than a greenhouse. Some of these companies would include; BC Northern Lights which help in hydroponic growth boxes, HotHouse Consulting which specializes in indoor growing techniques, and Aurora Larsson Projects which also helps in greenhouse development. In all, this facility plans on a high yielding crop while cultivating top quality marijuana at a low price. Another important facet to this facility is management's readiness to shift towards market desires. They are open to switches in cultivation and production techniques which gives them the flexibility to change in such a young industry. Being able to cater to the customer is incredibly important because as recreational marijuana becomes increasingly available, more data and input from customers can be used to create a desirable product. How Will This Effect Revenues? Management recognizes the global opportunity for marijuana and believes that there will be an increased need for marijuana as popularity grows both in the recreational and medical sectors. With this new addition, Aurora should be able to produce at least 80,000 more kg of marijuana per year which is by no means an insignificant amount. In Q2, Aurora had a net selling price of $6.23 per gram for dried cannabis at a production cost of $1.92 per gram so this can be extrapolated to an increase of (498,400,000-153,600,000) =$344,800,000 per year in extra gross margin. This calculation is on a very crude basis that only includes dried cannabis, but it stands as an example of the profitability of the addition. If we were to include Aurora's projection of $1 per gram with an increased selling price due to fewer taxes, this number creeps closer to an extra $500,000,000 per year. Obviously, there are increased costs associated with building additions to the facility but nonetheless, Aurora stands to make a considerable profit with the addition. So how did investors react to the announcement? Well, not much happened. With ACB only having institutional ownership at 8.67%, retail investors may not have seen the potential significance of this move and therefore not taken action. Currently, what I see on this chart is ACB is in a descending triangle that was formed after its recent gap-up. 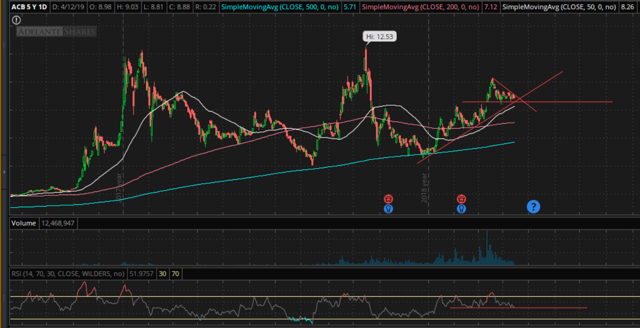 This stock also has a line of support that is holding a significant uptrend and there is nothing to believe it won't hold. With the descending triangle (bullish signal) and the uptrend line paired with the good news of an expansion I believe that for now, the path of least resistance for ACB is to continue up. In all, I am impressed by the addition and believe that the state of the art facility will be able to produce top quality marijuana at an ever-increasing production cost. Paring this with the technicals, I believe that ACB is poised to increase as it keeps delivering positive news. Disclosure: I/we have no positions in any stocks mentioned, but may initiate a long position in ACB over the next 72 hours. I wrote this article myself, and it expresses my own opinions. I am not receiving compensation for it (other than from Seeking Alpha). I have no business relationship with any company whose stock is mentioned in this article.